Lately I was working on this painting “Longly Field”. 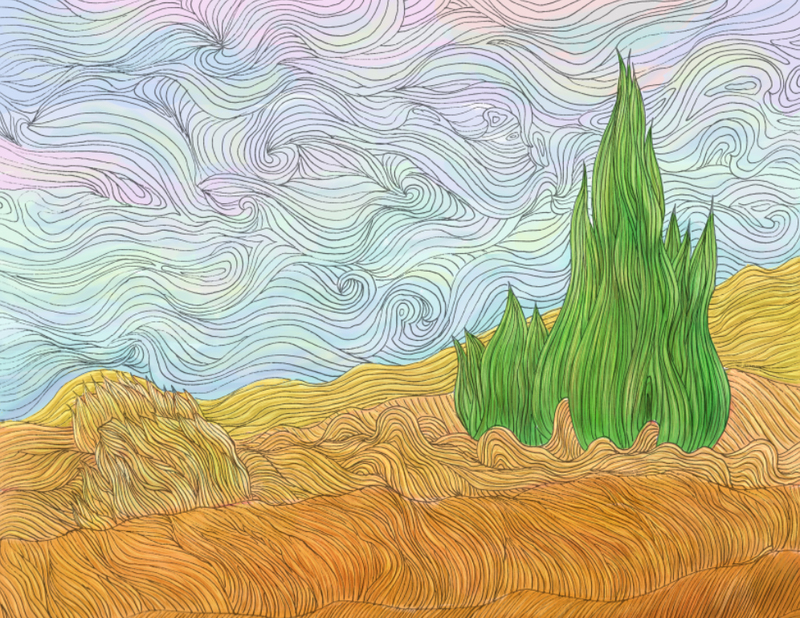 As you can see, it was inspired by one of Vincent van Gogh’s classic paintings “Wheat Field with Cypresses”. Throughout his life, Van Gogh was said to be an extremely lonely person. No doubt his use of bold colors and decorative designs were the product of intense loneliness. I love being alone as much as socializing, sometimes socializing could give me many fun experiences and balance my life, some other times I enjoy to stay in my own world to create new works, focus, calm, and imaginary. Prints of this painting available Here. Jul7July 7, 2014 • By Helen H. Wu • This entry was posted in Illustration, Painting and tagged alone, archival quality prints, Artwork for sale, bold colors, classic paintings, Colorful, Etsy, Helen H. Wu, Home Decor, Illustration, imagination, lonely, lonely person, painting, Vincent van Gogh, wheat field, Wheat Field with Cypresses. Bookmark the permalink.